Every now and then I deviate from this blog's usual diet of newspapers, the BBC, RSS and moaning about badly broken websites, and move into the realms of the paranormal, with accounts of ghost walks I've done with my wife. I'm a sceptic myself, but I love the way ghost stories weave themselves into the fabric of local history, and given that lots of ghost stories revolve around haunted pubs or inns, I find the walks perfectly enjoyable. During our recent stay in the UK we did four walks around London, all taken from the Richard Jones book "Walking Haunted London". However, on the last day we were in the UK, I laid on a surprise trip for my wife to Cambridge, to see Idlewild play at The Junction, and to go on a haunted tour of the town of my own devising. I was aided and abetted by the book "Cambridge College Ghosts" by Geoff Yeates, which I picked up for a bargain £2.99 from the Amazon marketplace. We were staying at the Royal Cambridge Hotel, and so our walk started at Hobson's Conduit, which used to drain the surrounding area. In fact, the drains cut into Trumpington Street as part of the waterworks formed an element of our first, rather fanciful, haunting. 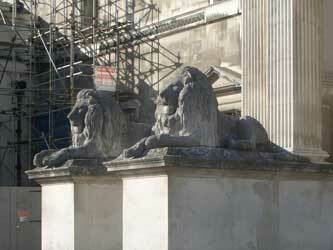 The lions that decorate the outside of the Fitzwilliam Museum are said, at the stroke of midnight, to come to life, walk down from their perches, and drink from the guttering in the street, before returning to the museum. I'd wager there are enough students wandering around this area at midnight to bear witness that this doesn't happen, but there you go. The story echoes a tale we found in Venice when we were travelling. 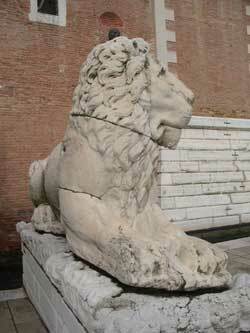 There, outside the gates to the great Arsenale, stand three lions, gifts from Greece, which apparently came alive at night under the black magic power of a local magician. One of them was decapitated during its nightly excursion, which is meant to explain the bad join in the stonework that is visible today. The gate itself commemorates the 1571 Battle of Lepanto, one of many key battles over the last thousand years between the Christian 'West' and the Islamic 'East'. Our next stop was Corpus Christi College. 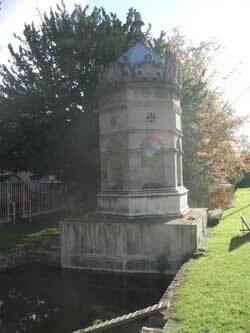 This wasn't open to the public at the time, so we had to stand outside to relate the story of The Corpus Ghost. This is meant to be the spirit of Dr Butts, a master of the college who hanged himself on Easter Day in 1632. The apparitions took place in the early 1900s, and involved lots of mysterious noises, and then the vision of a ghost, cut off at the knees. This is taken to identify Dr Butts, as he apparently hanged himself from a very low height, and had to draw up his legs behind him at the knee in order to dangle. The second college we visited was my wife's near-namesake, Clare College. It is set back a little bit from the main hustle and bustle of town, although thanks to the legions of cyclists going down a very narrow lane at breakneck speed we wondered if we'd ever make it in one piece. Once we got there we found that the courtyard leads out to a beautiful bridge across the river, and with the leaves beginning to turn golden it was quite an idyllic spot. 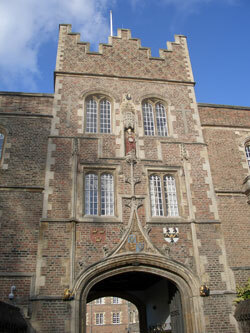 The story of Clare's College in the Geoff Yeates book was not a traditional ghost story, but the story of a rather over-conceited scholar who left an extraordinary bequest to the University. The will of Dr Robert Greene stated that upon his death the college was due to inherit his wealth, provided they set up prizes in his name which involved giving a speech in Latin on the virtue of piety - gripping stuff, I'm sure - and, more bizarrely, provided they displayed his skeleton next to a book-shelf carrying his works and personal library. The college did comply, although there was some doubt about whether the skeleton was actually that of Dr Greene. It was eventually put in a closet (and is thought to perhaps be the origin of the phrase) and disappeared - allegedly bone by bone at the hands of students wanting a souvenir of their time at Clare! 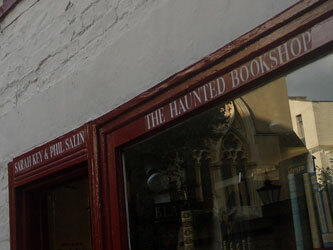 Next up was a haunted bookshop, which in no way traded on the reputation by being called..."The Haunted Bookshoop". 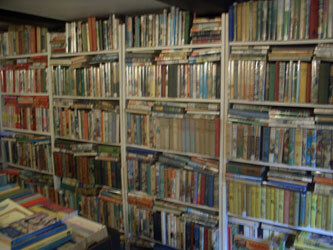 We found it very sweet, although it stocked some shockingly expensive collectible early editions of children's books. I also spotted a Blake's 7 and a Doctor Who annual that I used to own as a kid, both of which I would probably have bought if it wasn't for the price tag and the thought of carrying them from the UK back to Greece. Despite making a show of being haunted in the name, we didn't see the Victorian couple who supposedly browse the racks. 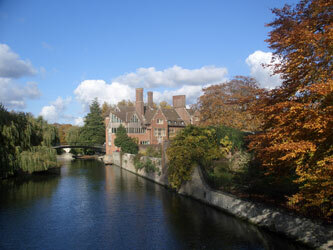 After that it was on to St. Johns College. The ghost story associated with St John's doesn't take place in Cambridge at all, but does feature characters with links to the college. It concerns a spiritual visit by a Mr John Naylor to an old friend Geoffrey Shaw - despite Naylor having died several years previously. Naylor told Shaw about his own impending death, and that of a mutual acquaintance, Arthur Orchard. Shaw related the tale to a visiting friend, Robert Grove, who was passing through on his way back to Cambridge. When he got there he was astonished to learn that Arthur Orchard had suddenly died, and only a few months later, as predicted by the ghostly apparition of Naylor, Geoffry Shaw followed him. This all took place in the early 1700s, and it caused quite a stir at the time. The tale was told in letters criss-crossing the country, and began to appear in pamphlets. Of course, some of the details got blurred, but what seemed to lend the story an air of credibility was that all of the main characters were sensible men of God and learning. Tomorrow, I'll continue our haunted trip around Cambridge, with visits to Sidney Sussex, Jesus, Emmanuel and Christ's College, plus a quick dash past the BBC's Cambridge studios. Haunted Clerkenwell, Haunted St Paul's and Barbican - "The city of the dead", Haunted Knightsbridge, Kensington and Notting Hill, Haunted Westminster and Piccadilly, Haunted Liverpool Street to Mansion House, Haunted Walthamstow and Chingford, Ghosts by Gaslight, Haunted Belgravia and Chelsea, Haunted Canterbury, Haunted Cockfosters and Enfield, Haunted Malta, Haunted Great Portland Street and Theatreland, Haunted Highgate, Haunted Chiswick, Haunted Holborn and Haunted Hampstead. By Martin Belam on 29 November 2007. Thanks for mentioning my book! I look back on it now with a mixture of pride (for having had a book published at the first attempt) and embarrassment (for the over-elaborate writing style, which I do not think I would use now!). 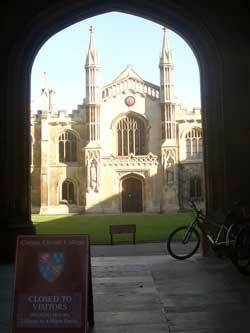 Nevertheless, it was great experience and I learned a lot about Cambridge (and ghosts) while I was writing it. I would love to believe in ghosts but sadly have never seen any evidence and that includes photographing graveyards as a hobby. If ghosts existed place like London would be full of them, think of all the millions of people who have died there over the centuries. If only I tiny fraction of spirits remained to haunt a place, in London they would be tripping over each other.